When my brother, Adam, was in kindergarten he would dismember our oldest sister's Barbies and hide the body parts around the house. Kristin would come home from school, furious, and have to locate and reassemble the limbs and heads and bodies. I have a little boy in kindergarten. He isn't dismembering Barbie's anymore... that's child's play for Mr. Harper. The latest scandal for our kindergartener is that he has been getting off the bus early to partake in our school's breakfast program, which is a great program designed for low-income families who are unable to provide breakfast for their children. My Harper has been double-dippin' on breakfast the whole school year and we didn't know it. The bottom line here is that even boys who grow into fine young men like my brother Adam was, they all start out as tiny, nightmarish fools. For Day 22, I chose to pop in on my friend, Karolin. She spends her days (and oftentimes long hours into the nights) shaping these monsters into single-breakfast eating ladies and gentleman. She is a generous, strong and selfless woman, putting her friends and students ahead of herself... so we paid her a visit. 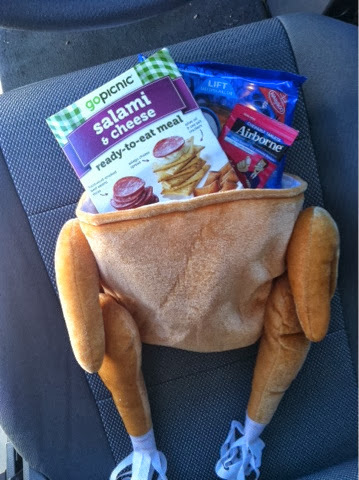 Sometimes a teacher like that deserves a turkey hat full of goodies.